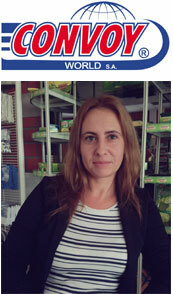 Interview with Zorniza Atanasova, Trade Managet at „Convoy-World"
„Convoy-World"is a leading manufacturer and trading company specializing in the development, production and distribution of household products. How many years have you in the market and how did you start? "Convoy-World" marks the beginning of its business in Thessaloniki, Greece in 1985. In 1989 the Company opens its first stores in Plovdiv and during the next two years, the company open own warehouse. The production of household sponges, cloths and floor mops starts in 1991. In 1995 it was decided to major commercial expansion on the market in Bulgaria and as a result, began developing the distribution network in the country, opening an office and warehouse in Sofia. Coming years are extremely dynamic for the development of "Convoy World" in Bulgaria as it creates new organizational structure, involve professionals in the fields of management and development of manufacturing facilities, sales force. The company opens offices in Varna, Bourgas, Rousse and Veliko Tarnovo. In 2000 "Convoy-World" opens its new and modern establishment located on 30 000 square meters area in the city Novi Iskar and gradually start production of polyether and polyester foam under the brand "CONVOPREN". Besides being manufacturer, "Convoy World" is a company known as exclusive representative for Bulgaria Brand "Paclan" - garbage bags, household gloves, household foil, HoReCa products and "Curver" - foodkeepers, storage boxes ( interior design). The portfolio of these two brands fully complements our assortment. Tell us a little more about the Convoy - World. What are your newest products? Our portfolio currently includes a wide range of products with applications in "Cleaning & Hygiene” sector under brands - "Magic Clean Premium", "Magic Clean" and "Enjoy" and sector "Body Care" - "Comfort". Besides our brands we also produce Private Label products not only for our partners in Bulgaria but also for our customers in more than 25 countries worldwide. We update our products and production processes and can boast of sustainable growth and financial stability. This year we decided to invest in two new European financing : submitted a project proposal for the scheme "Improving working conditions in the" Convoy World "AD" - Human Resources, BG05M9OP001-1.008 - "Good and safe working conditions"; and also a project proposal under the "Innovation and Competitiveness" 2014-2020. We are celebrating an anniversary this year - 25 years as a leading production company in Bulgaria. We are marking the celebration with tombola prizes for our loyal clients and a series of presentations and demonstrations of our products in the commercial network. The big challenge for us is to make our clients to connect Convoy’s products quality with the most competitive price. And for the future to manage to compete with world famous brands, not only on the Bulgarian market but beyond its borders. Please tell us what you will present of the exhibition CleanExBG. What do you expect from that participation? The market for household sponges, wipes and floor mops evolve and we strive to be the first offering an innovative product that is in line with trends. This year we invested in renovation of our brand "Magic Clean Premium". The core of that project was the concept for maximum environmentally friendly production of raw materials, looking for innovative solutions in respect of quality of materials, colors, vision. Our aim was to develop a range of household sponges providing antibacterial protection. Household sponges are used constantly in our daily life but having poor information about them. For example the material of which the sponge is made is extremely important because it determines how quickly will be spend the more expensive consumable - the dish liquid, we work with. We have prepared a series of presentations and demonstrations to introduce our Customers better with the characteristics of our products. During the exhibition CleanExBg we will present our portfolio as we will put a focus on "Magic Clean Premium" - innovative products for impeccable hygiene at home and all around us. CleanExBg is another opportunity to meet our long-standing Clients and new Partners who would sell and use our products successfully.